Navy showers are a method of showering that allows for significant conservation of water and energy. An initial thirty seconds or so are used to get wet, after which the shower is turned off. This is followed by soap and lather, which is then rinsed off in a minute or less. The total time for the water being on is typically under two minutes. Navy showers originated on naval ships, where supplies of fresh water were often scarce. The idea has been adopted by many people who wish to conserve water and the energy needed to heat the water, for both environmental and economic reasons. A ten-minute shower takes as much as 230 L (60 U.S. gallons) of water, while a navy shower usually takes as little as 11 L (3 U.S. gallons); one person can save 56,000 L (15,000 U.S. gallons) per year! Recycling is an easy and effective way of reducing stress on our planet's increasingly limited resources. Read your municipal guidelines to ensure that you're recycling only the correct materials. Other than that, recycling is simply a matter of habit... and it's a very good habit to get into. To my mind, farmers are the great unsung heroes of civilization. Without them, civilization simply would not have developed. Ironically, the very civilization that agriculture gave rise to now threatens the land and resources that we need to grow our food in a healthy and sustainable way. There are still farmers amongst us, however, so get out there and support them! Don't quibble over price if you end up paying more for locally produced fruits and vegetables. You aren't just paying for the produce, you're paying to keep local farmland allocated to its current agricultural use. Otherwise, that land will be converted into commercial and residential properties, and there will be less farmland available. Moreover, the farmland that is available won't necessarily be local. Thus, we could all very easily end up paying more for produce that needs to be shipped greater distances. That's not good for the environment or your pocketbook. Watching television not only consumes precious electricity, it is both unproductive and psychologically addictive. How many times have you heard people say, "I need that television at the end of the day to help me decompress"? That's the equivalent of saying, "I need that cigarette to help me relax." Of course, we know that the cigarette does nothing to help one relax. Rather, it is simply the temporary satisfaction of a physiological addiction that momentarily reduces stress. Without the addiction to nicotine in the first place, the cigarette would have absolutely no impact on one's mood or disposition. The same can be said for television. It is the satisfaction of the addiction that brings about the stress relief. If you don't believe me, try physically removing your television for a few days. At that point you will quickly and profoundly observe the degree to which you were addicted to television. The good news is that you can just as easily become addicted to something that is healthy, productive, and uses less electricity. (See "Green Fun" below.) Networks and big corporations won't like losing you from TV land, but society and the environment will be very happy to have you back in the real world. This is easy and very effective. Just follow these steps: 1. Talk to the people you work with. Find out who lives either: a) close to you, b) between you and work, or c) in a location that has them driving by where you live. 2. Propose car-pooling to individuals who comply with any of the above scenarios. 3. Suggest that you drive one week, and they drive the next. Bingo! You just cut your gas costs and your fuel emissions in half! If you can get three or four individuals into a given car-pool, all the better. Guess what... car pooling turns otherwise boring commutes into fun social time as well. It's definitely a win-win scenario! Feel free to challenge your colleagues to take the #GreenNeighbourChallenge by carpooling to work starting tomorrow! Video games... what a pathetic waste of time. Playing video games not only consumes precious electricity, it does nothing to improve one's physical health or develop meaningful talent, skill, or ability. If you think playing some phony electronic toy guitar is fun, imagine how much fun playing a REAL guitar might be! If you think playing some game of virtual soccer is exciting, imagine how exciting playing a REAL game of soccer would be. Video games have probably done more to hinder the prospects of Generation Y than anything else. Name something else that gives someone a completely artificial sense of accomplishment while at the same time preventing them from socializing, developing actual talents and skills, or getting exercise. Gas cars are horrible for the environment, they're unreliable, and they're extremely costly to both drive and maintain. Even the most fuel-efficient gas car still costs the average driver thousands of dollars in gas over a year. They cost hundreds or thousands more in servicing, and, as incredible as it might sound, a single bad spark plug can leave you stranded and end up costing you $400.00 in unexpected repairs! Just take a look at the repair bill below if you don't believe me. 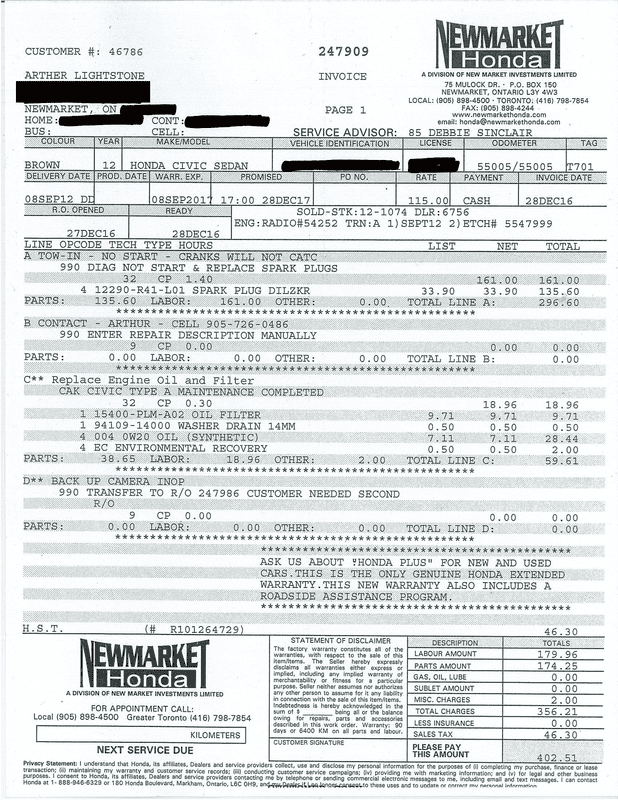 This is the bill that resulted from a single bad spark plug that prevented my 2012 Honda Civic (the most popular car in Canada) from starting on Boxing Day, 2016. The car only had 55005 kilometres on it, and, as you can see from the servicing invoice, the car was still under warranty... but not the spark plugs! The car's failure to start caused flooding in the engine, which apparently caused gas to get into the oil. Thus, the oil also had to be changed. All-in-all, the damage to my pocketbook was just over $400.00, all from a single bad spark plug. That's the kind of nonesense that can happen with a gas car at any moment, even with one of the world's most reliable cars. I dare say, I think the gas engine's days are numbered. Having to actually "start" a car will soon seem as antiquated as hand-cranking a car to get it going. Nobody ever liked dealing with that, and the consumer's of today are no different. We want reliable, worry-free, clean, and convenient technology. As much as car dealers will tell you that "consumers demand gas cars," it doesn't take much investigation to see that the demand for electric vehicles FAR outstrips the supply. If you want to buy an electric car, you have to be prepared to wait months or even years on a waiting list. EVs sell like hotcakes, so why on Earth are car manufacturers still producing so many gas cars? ​​​If you can't give up driving altogether, you can certainly explore car-pooling to work or replacing your gas automobile with an electric or hybrid vehicle. Better yet, do both! Carpool to work in an electric or hybrid vehicle! There are a lot of great all-electric options available on the market, and their ranges are getting longer every year. I've put some time into testing out some of the more popular pure electric vehicles available on the market, and I've been quite impressed. These certainly aren't golf carts. These cars are more than capable of hauling around a typical Canadian family AND their hockey gear! Take a moment to watch the Green Neighbour's Great Canadian EV Hockey Bag Test. Try this fun little activity the next time you're out walking - especially if you have young children. Simply bring a bag with you on your walk. Then start collecting the pieces of litter that you pass on your way back home. Your little ones can either get in on the action of collecting, or, if they're too little to walk, they can just sit in the stroller or wagon and point to the pieces of litter that they spot. Either way, you can award points for pieces of litter collected or spotted, and then reward your kids with a treat when you get home. This is a surprisingly satisfying activity and it's quite effective. Once you do this on a given walk, the next walk along the same route will be much cleaner. You will find that people are far more hesitant to litter in areas that are not already full of litter. There are plenty of ways to have fun without using electricity. Television and video games are not only completely unproductive, they are psychologically addictive and they consume electricity. Try giving yourself a break from these forms of recreation by exploring some of the many green ways to have fun. You'll find that green ways of having fun are not only environmental, they tend to be healthier and more social.